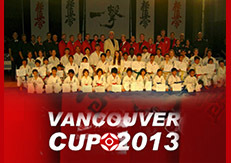 The 2013 Vancouver Cup was successfully held on Sunday, December 1st, at BCIT in Burnaby, BC. In attendance were Branch Chiefs, Shihan Andre Gilbert, from Montreal, and Shihan Patrick Fard, from Los Angeles. Competitors from British Columbia, Alberta, Quebec and New Brunswick competed in the various kata and kumite divisions. This entry was posted	on Monday, December 2nd, 2013 at 11:38 pm	and is filed under Uncategorized. You can follow any responses to this entry through the RSS 2.0 feed. Both comments and pings are currently closed.